Some people put off signing a power of attorney, because they are worried about losing control of their finances. However, you can choose when your power of attorney becomes effective. The power of attorney can take effect immediately, or not until you become unable to manage your own affairs. By choosing to delay the effective date, you retain control of your affairs until you are no longer able to take care of things. At some point in their lives, most people will need help doing such things as writing checks, paying bills, filing taxes, buying and selling property, and other transactions. By planning ahead and executing a power of attorney, you will be sure that someone you trust will have the authority to conduct business for you and preserve your assets for you. 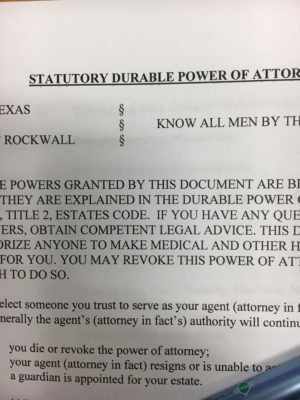 If you are interested in discussing a power of attorney, or other estate planning issues, call us today at 972-771-8011. Todd White and Tisa White are ready to help you.